Thomas: The simplicity of the New Balance Beacon is its beauty. An uncomplicated knit upper, attached tongue that locks down the arch, and a one-piece midsole are the ingredients that compose this trainer, and they work together marvelously well. The knit upper fit true to size with no rubbing or hotspots. Its simple design should accommodate multiple foot shapes and volumes. The heel counter is lightly padded and does a fine job keeping the ankle in place without any lift. 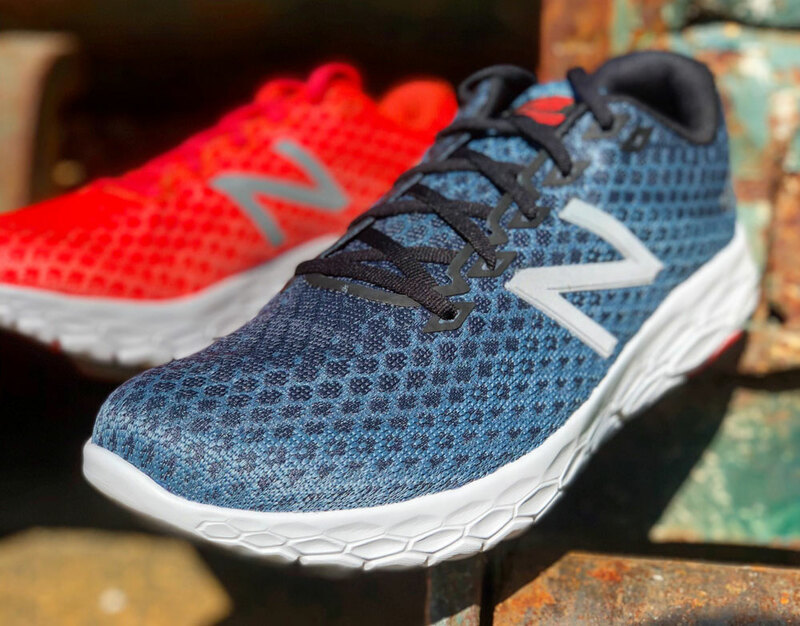 The one-piece midsole is constructed from New Balance’s Fresh Foam, and it might be the best feel I have tested. It’s near perfect with a firm feel that gives just enough on landing to cushion without draining the energy out of your stride. Did I mention how light these are??? 8.1 oz. or 231 grams. They feel light on the feet and fit well enough to feel secure at higher speeds. 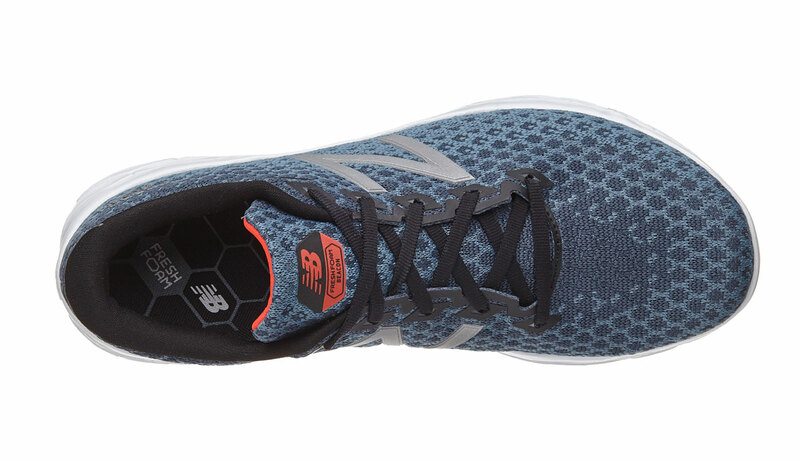 Meaghan: The New Balance Fresh Foam Beacon is a lightweight, neutral daily trainer. 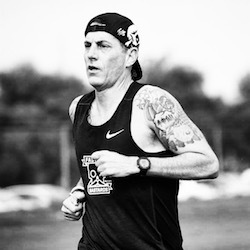 There are no crazy marketing gimmicks, no frills, just a sleek, simple, comfortable running shoe. It’s the shoe I didn’t know I needed until it was here. And now I’m lacing them up every day. 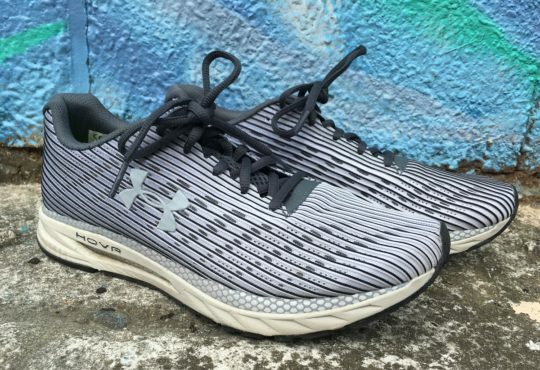 The engineered knit/synthetic upper is soft and light. It’s breathable, comfortable, and secure on the foot without being restrictive. It’s designed with a two-toned, unique pattern, almost like a honeycomb. Aside from the “N” logo and on the side, there are no overlays. The simple lacing system and lightly padded tongue add to the comfort and structure of this shoe. 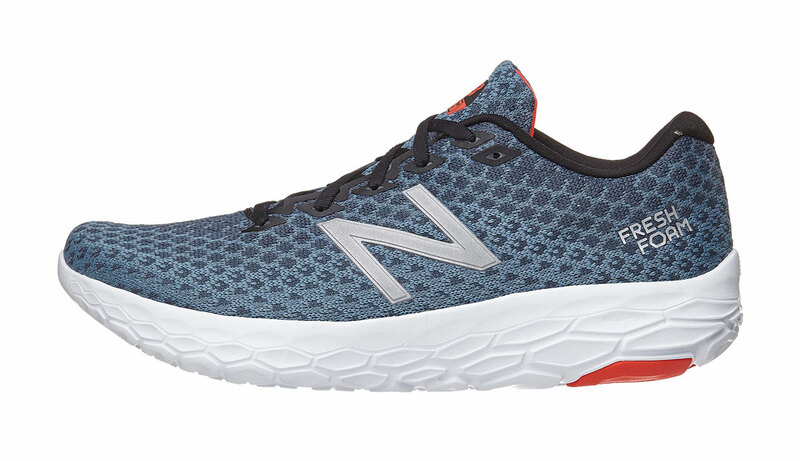 Underneath the foot is New Balances’ Fresh Foam technology. 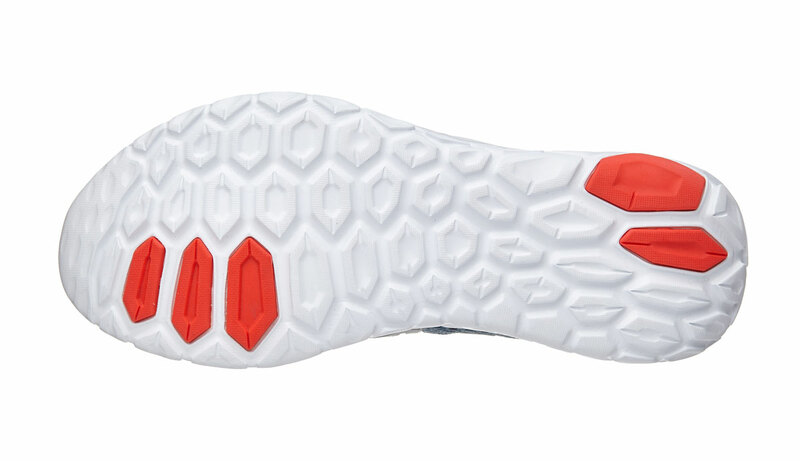 The Beacon’s midsole is designed with their new “Ground Contact” foam which is apparently more durable than earlier versions… which explains why there isn’t a ton of rubber on the outsole. Which also explains why they’re so freakin’ light. My W7.5 came in just under 6 oz. I know… WHAT. Yes. Thomas: Some people are concerned about the exposed Fresh Foam on the outsole. For me, it is a cosmetic issue, not a performance issue. With that said, it will really depend on how the individual punishes outsoles. If you shred shoes you may want to skip this one. Other than that, I have no complaints about the New Balance Beacon. Thomas: This 6mm drop, lightweight trainer is sparsely designed and elegant in its simplicity. Even better, the design translates into a smooth ride at various paces. 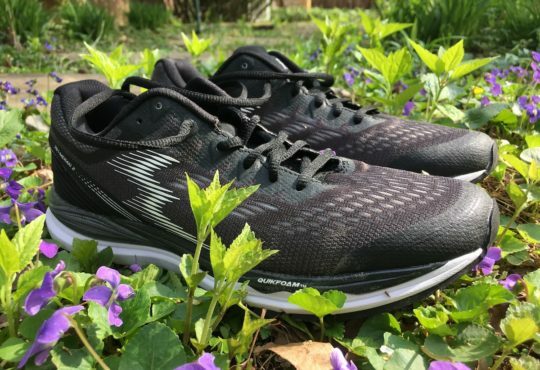 Beacon’s featherweight works for both training runs and racing and at $119 it is positioned to be one of the best values in the running shoe category that is starting to see more shoes over the $150 mark than ever before. The New Balance Beacon gets a thumbs up from me. It looks good, it is lightweight, it is affordable and it performs well. New Balance hit the mark on the Beacon. 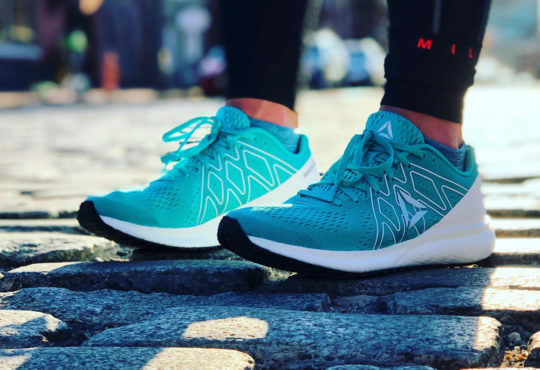 Meaghan: The New Balance Beacon checks all the daily trainer boxes for me: lightweight, comfortable, breathable, well-cushioned, and good to look at. From aesthetics to performance, the Beacon is a winner. 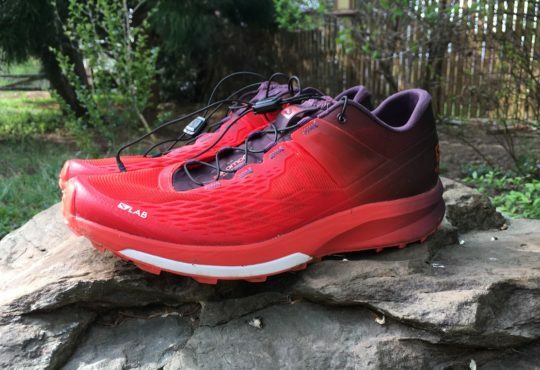 I love these shoes like I love the Pegasus 35 and HOKA Napali… but maybe a smidge more. If these shoes aren’t in your closet, you’re missing out. Seriously. Go get a pair. And might I recommend the Air/Summer colorway. How would you compare the Beacon to the Epic React? Currently debating which one to pickup. Thanks and keep up the great job! The Epic React is softer. Both are about the same weight. The Beacon is $30 less expensive. Both are top shoes. I’m a slight heel striker and found the Beacon super squirrelly, with that rounded heel on both lateral and medial sides. Even while standing my feet wanted to roll out. Reminded me of some of the early Brooks Pure shoes. I’ll stick with my Nike React Odysseys (which by the way are the same price as the Beacon). The Beacon had a smooth transition but the React is even better. 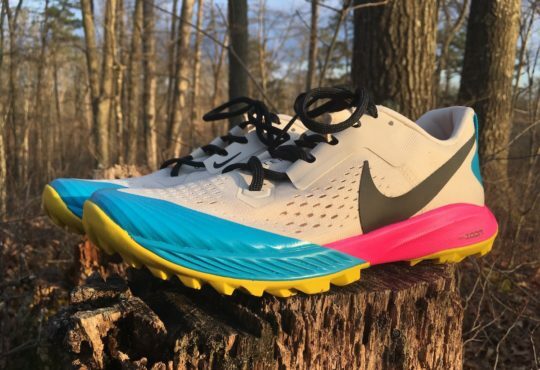 Would this be a good first time marathon shoe? I’ve been training in NB Ravenna 9s and Hoka Napalis. They’re going to worn down by marathon time in Nov and this shoe looks really great. I love light weight shoes that have plenty of cushion but disappear on your feet. This could def work for the marathon distance. I’m a mid foot striker but have had issues with squishy heel shoes too. The Nike FreeRN comes to mind. Seems like this can result in tendon problems from my feet trying to find placement with each stride. How are you liking the Odysseys? I want some fun cushion for a marathon shoe but need a bit of firmness too. 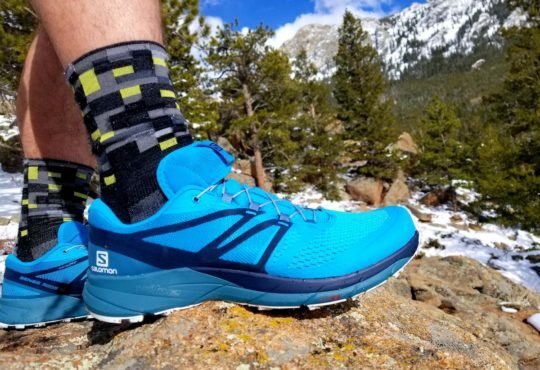 Any thoughts on the Beacon vs Gorun Ride 7? Yes, we reviewed them both. Great shoes.